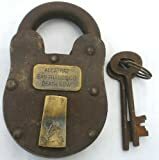 When it's time to lock something up, do it with style when you secure your stuff with one of these cool new Old-Time Padlocks. These solid riveted iron locks are functioning replicas of padlocks used by Alcatraz, Fort Knox, and the U.S. Mail. They feature two skeleton keys, brass keyhole flaps and a stamped brass name-plate. Although not as secure as modern day combination locks, any lock with a skeleton key will always be cooler. Perfect for locking up wine cellars, bicycles, backyard sheds and creepy home dungeons.